A Not for Profit ‘scorecard’ detailing chocolate companies’ efforts to address child and forced labour in cocoa production has found The Hershey Company is doing the least to tackle the problem of all the major companies currently selling chocolate in Australia. The inaugural scorecard is produced by the Uniting Church across Australia as part of a campaign called “JustAct”. “From what companies have publicly disclosed, The Hershey Company is the chocolate company that appears to be putting in the least effort to ensure cocoa production in West Africa is free of forced and child labour,” Dr Mark Zirnsak, social justice spokesperson for the Uniting Church in Victoria and Tasmania said. He says Côte d’Ivoire and Ghana are two of the largest producers and exporters of cocoa in the world. “It is estimated 70 per cent of the world’s cocoa comes from West Africa. The most recent figures estimate that 1.8 million children in West Africa are involved in the industry." 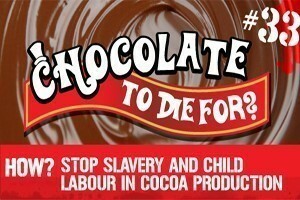 “A 2002 report by the U.S Department of State estimated there were 109,000 child labourers working on cocoa farms. Some of these children are being forced to work against their will, but the majority are children working on family farms. “The work that is required of these children includes being exposed to dangerous pesticides and chemicals, using machetes, travelling great distances and working in the blistering heat for long hours for little or no pay. In most cases this work is considered to be some of the worst forms of child labour as it has the potential to be extremely harmful,” Dr Zirnsak said. Dr Zirnsak says the scorecard was presented to the five major companies for comment. He says Hershey responded via email to say that the company had plans to address the issues around cocoa production in joint engagement projects in the next five years. “Mars and Nestlé are to be commended for being the most transparent about their efforts to ensure there is no forced or child labour in the cocoa they are using,” Rosemary Hudson Miller, the Associate General Secretary of the Uniting Church in WA said. “Kraft/ Cadbury started strongly in addressing these problems in 2009, but in the last two years have not offered the public a clear picture of what they are doing”, Dr Zirnsak said. It appears that these companies only act justly when the eyes of the world are upon them. Yes, they do betray children. They also betray their founding spirit. Hershey, Cadbury, Nestle etc were all founded by people with strong feelings of social justice responsibility – time and change have seen the loss of these to the demands of capitalism. All praise to the Uniting Church for renewing the pressure on these companies. Personally, no more Hershey…!